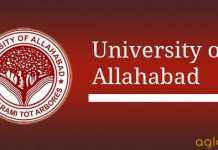 University of Allahabad, a premier Institute of learning and research, invites applications for following Post Graduate Courses to the students desirous for admissions to the courses for academic session 2018-19. PGAT Test is classified in Two Groups. PGAT-I consisting of List-I to List-IV is for conventional Subjects. PGAT-II consisting of List-V is for Specialized / Nonconventional Subjects. University of Allahabad shall conduct Post Graduate Admission Test, hereinafter called PGAT- 2018 for admission to various Post-Graduate courses/subjects of the University of Allahabad for the session 2018-19, as specified (along with their numerical codes and number of seats) in the TABLE-I on an inner cover page of this Brochure. Admission will be made according to merit in the PGAT-2018, subject to fulfilling the eligibility requirements mentioned below and availability of seat in the particular course for which the candidate has applied for and appeared in the PGAT- 2018. 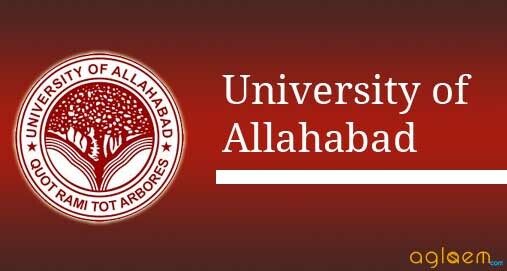 Latest: Admit Card for PGAT (I & II) 2018 has been released by University of Allahabad. Candidates can download the same from the link provided in “Admit Card” page given in quick links. University of Allahabad announces Post Graduate Admission Test, hereinafter called PGAT-2018 for admission to various Post-Graduate courses/subjects of the University of Allahabad for the session 2018-19. Admission will be made according to merit in the PGAT-2018, subject to fulfilling the eligibility requirements mentioned below and availability of seat in the particular course for which the candidate has applied for and appeared in the PGAT-2018. Candidates can submit online form for the PGAT-2018 test at the website www aupravesh.org. The website provides all the information required for online form submission. The direct link to fill the online application form will be updated here. Step 6: Take a Print out of Filled Application Form with Transaction ID Printed on it. For all the Courses, Eligibility Conditions are given below. Kindly study the Eligibility Conditions carefully before filling any Form. for only those subjects with whom a candidate has appeared/passed Graduate in any stream, Third Year Examination or Equivalent Examination. No candidate is allowed to appear in any examination in which he/she has not appeared/passed at any stream of Graduation at Third Year. Graduation i.e. 60% marks above. Level or had studied Economics upto B. A. – II Year. 1. First Fifty Questions will be of General Awareness, General English, General Hindi and Mental Ability. They are compulsory for each student. 2. There will be Two Set of 50 Questions related to Subjects which the candidate has offered. 3. If a candidate has offered only one subject he/she will have to solve 100 questions i.e. The applicant must take due care while filling up the Online Application Form. The information provided by the applicant in his/her Online Application Form shall not be changed or altered in any case and the University will not entertain such request under any circumstance. The University shall not be liable for any mistake made by the applicant. In case if the number of registered candidates at any of the examination centers are twenty-five(25) or less, then in such case the registered candidates will be allotted Allahabad Centre. There is no provision for revaluation/scrutiny of Answer copies. In case of any discrepancy in Hindi version, English version of the brochure will be treated as the correct version. Admissions to the courses of study referred to in SECTION I are governed by the relevant provisions of the University of Allahabad Act 2005 and the first ordinance made under section 29(2) of University of Allahabad Act 2005. In the case of such candidates as may be exempted from the Admission Test, the Standardized Score, for any subject shall be calculated, for the denominator of 300, on the basis of the marks obtained in such subject in all the Parts of the Three-year Degree Course examination taken together. The marks obtained by the candidate in the Admission Test for M.A./M.Sc. in any subject (on the denominator of 300) shall be his Standardized Score for such subject in general. However, for admission in M.A./M.Sc. in Statistics, the marks obtained in the Admission Test for Mathematics shall be the Standardized Score for a candidate who has passed the Graduate examination with Mathematics but without Statistics. The marks obtained in both the subjects in the M.A./ M.Sc. Admission Test shall be converted to the Standardized Score by summing up the marks obtained in test in the two subjects and calculating standardized score on the denominator of 300. Such standardized score will be used for calculation of merit for admission to M.Sc. Computer Science, M.Sc. Applied Geology (Earth & Planetary Science Deptt.) as well as in the case of the Non-subject category and for admission to Hostels. When two candidates secure the same Standardized Score, inter-se merit shall be decided on the basis of the total marks obtained by the candidate at the Graduate examination after excluding the marks obtained in the Practical Examination. If there is a tie once again, the same shall be decided by draw of lots. The total of the marks obtained in both the subjects in the M.A./ M.Sc. Admission Test as calculated for a denominator of 300, shall be the Standardized Score of the candidate for the M.A. subject, as well as for M.A./M.Sc. in Defence Studies, for which he/ she is a Non-subject candidate and for M.Com. In case, in the circumstances referred to 1.4 of SECTION I, the candidate has appeared in the Admission Test in a single subject, as marks obtained by him in such single subject, as calculated for a denominator of 300. In case the candidate is required to appear in two subjects in the M.A./M.Sc. Admission Test but has appeared in only one subject, for the calculation of his Standardized Score under this Rule, it shall be deemed that his score in the second subject, in which he did not appear, is zero (0). The Computed Marks of all candidates (who have appeared in the Admission Test), for each subject of M.A./M.Sc, and for M.Com.. shall be determined in accordance with the procedure laid down in paragraph 2.5 of this section. 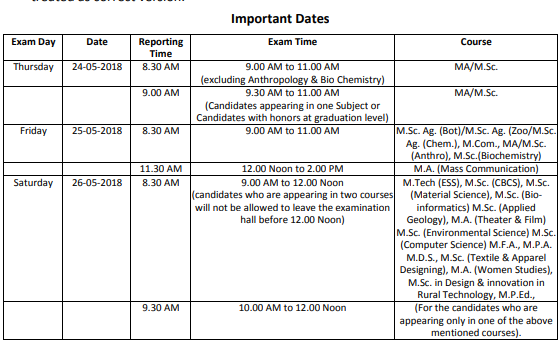 Admission shall be made in each subject and in M.Com up to the limit of seats available in the same, in the consolidated order of merit of Computed Marks, but admission shall be granted to candidates of Special Categories (such as. Non-subject candidates. Arts and Science graduates for admission in M.A./ M.Sc. Anthropology, Outstanding Sports persons, Physically Challenged, etc.) only up to the maximum limit (ceiling) of seats assigned to each such category, Separate orders of merit shall be drawn for unreserved (General) seats and for reserved seats for the Scheduled Castes, Scheduled Tribes and other categories for which reservation is applicable. The candidates eligible for admission under the Special Consideration specified in paragraph 2.6 of this section shall be granted admission irrespective of their place in the order of merit list but without exceeding the prescribed ceilings in that regard. Admit Cards for all the valid applications received by the university has been processed and enabled on the website www.auaadmissions.com. The Candidates can download their admit card from the website after entering their Application ID and date of birth. Candidates must correctly enter their date of birth in the Online Application Form. All Admit Cards has been uploaded for all the valid applications one week before the actual commencement of the PGAT-2018 Test. 27 % of the total seats in each subject / course shall be reserved for candidates belonging to Other Backward Caste (OBC) category. mentioned their category in the On-line Form. For more details of Allahabad University PGAT 2018 – Download Information Brochure.